In an exceedingly animated and spirited final round of competition among three well-prepared teams, Chicago Team 1, came out on top. The presentation phase for the national finalists occurred on the afternoon of Monday, April 27th at the CIRT Spring Conference in Washington, D.C. While all three teams did an excellent job in presenting their entries, only one could claim the eminent honors and that went to: ACE Illinois/Chicago Team 1 for their “Park City” entry. In addition to the 2015 winner, Second Place went to ACE of Frederick, Maryland for their “BRT: Efficient Solutions for Road Transportation Systems” entry; and Third Place went to ACE North-East Florida, Orange Park H.S./Team Mark-0 for their “Harmony Springs Health Clinic” entry. 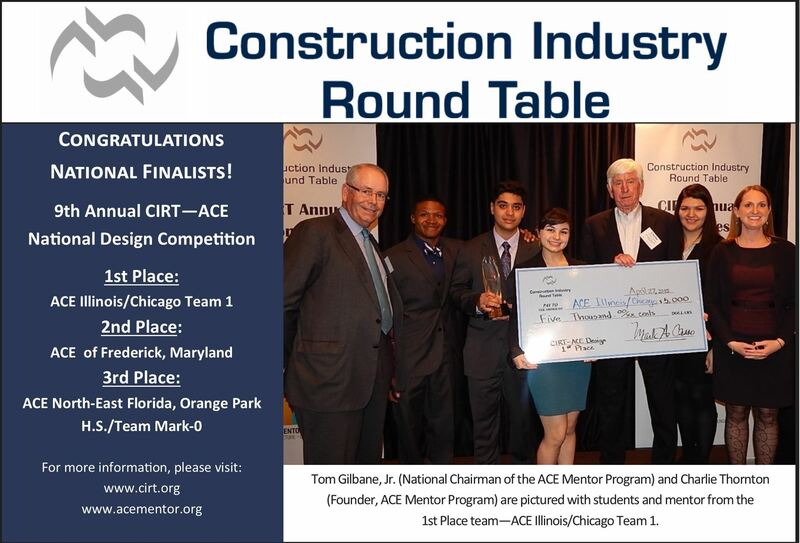 A record 46 entries (representing 20 Affiliates/Chapters) from across the country competed for national honors in the Ninth Annual CIRT-ACE Design Competition. The final round presentations were judged by a distinguished panel with chief judge Dr. Charles (“Charlie”) Thornton (Founder and Honorary Chair of the ACE Mentor Program of America), presiding over six others including: David S. Crawford, P.E., President & CEO, Sundt Construction, Inc., Thomas C. Donnelly, ASLA, President, ValleyCrest Landscape Development, Stephen E. Sandherr, CEO, Associated General Contractors of America (AGC), Nancy C. Somerville, Hon. ASLA, Executive Vice President/CEO, American Society of Landscape Architects (ASLA), Janice L. Tuchman, Editor-in-Chief, Engineering News-Record, and Maria Viteri, AIA, LEED BD+C, National Director for Sustainability, International Masonry Institute. The judges commented on how impressed they were with not only the overall quality and thoughtfulness of the entries, but on the incredible skill and poise the presenters exhibited in being persuasive and compelling advocates. CIRT looks forward to the 2016 competition and next year’s final presentations.